Cartoon Network has released its schedule of panels and events at New York Comic Con (NYCC), to be held October 6-9, 2016. Attendees will be treated to panels, signings and a costume ball on Friday and Saturday of the con. On Friday, October 7, Cartoon Network will host back-to-back panels in the Hammerstein Ballroom: Regular Show and Steven Universe at 10:30 am and 11:30 am. Afterward, both shows will have signings in the Javits Center at 2:00 pm and 3:00 pm. On Saturday, October 8, Powerpuff Girls will have a signing at 2:00 pm, with a panel at 5:15 pm. Both events will be held at the Javits Center. Best of all, Cartoon Network continues its annual tradition of holding a Costume Ball and Screening in the Javits Center at 1:30 pm. Come in your Cartoon Network cosplay and win prizes in their costume contest! It’s clear that Cartoon Network fans will be having a great time on Friday and Saturday of NYCC! Are you planning on attending Cartoon Network events at NYCC? Join the conversation at FoCC! For more details, check out Cartoon Network’s official press release below. Cartoon Network brings the special ingredient to an epic lineup of panels and events at this year’s New York Comic Con, including the first-ever New York Comic Con panel for the reimagined The Powerpuff Girls, an exclusive insider look at Steven Universe and a fond farewell to the Emmy-winning Regular Show! On Friday, Oct. 7, Cartoon Network will present back-to-back panel presentations in the Hammerstein Ballroom featuring fan-favorites, Regular Show and Steven Universe! Fans can bid adieu to one of Cartoon Network’s longest-running series at the Regular Show panel, featuring creator JG Quintel, at 10:30 a.m., and then stick around for Steven Universe at 11:30 a.m. to see Rebecca Sugar and a few Gems! Dust off your favorite Cartoon Network-themed Halloween costumes and head to Cartoon Network’s annual Costume Ball and Screening on Saturday, Oct. 8! Get a sneak peek at never-before-seen episodes from your favorite Cartoon Network series, including Adventure Time, We Bare Bears, Steven Universe, and its newest animated comedy, Mighty Magiswords. 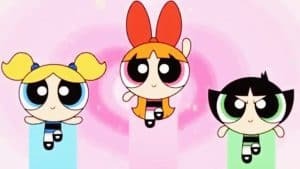 Then, later in the evening, meet Blossom, Bubbles and Buttercup as the cast and crew of The Powerpuff Girls make their New York Comic Con debut at the Javits Center! Below is a full list of Cartoon Network’s series panels, fan events, screenings and signings at New York Comic Con 2016, Friday, Oct. 7 – Saturday, Oct. 8. The countdown has begun. Grab your jet packs and rocket on OOOOOH-ver to Regular Show’s panel for its final season! Mordecai, Rigby and fellow park employees will take you on an odyssey through never-before-seen footage from inside the studio, along with a sneak peek of the new season of Regular Show…IN SPACE! Plus, you never know what special guests might beam up! Panelists include JG Quintel (Creator, Voice of Mordecai) and William Salyers (Voice of Rigby). Part of the back-to-back panel extravaganza followed by Steven Universe at 11:30 a.m. Calling all Crystal Gems! Join Steven Universe creator Rebecca Sugar and friends to catch a glimpse of never-before-seen footage and an inside look at the making of Steven Universe! Rebecca will also talk about her new book, The Answer. And when the Crewniverse is around, things are bound to get musical. It is an experience – we’ll make sure it’s a good one! Part of the back-to-back panel extravaganza preceded by Regular Show at 10:30 a.m.
Javitz (room TBD)Who’s got the power? We’ve got the power! Townsville’s toughest trio soars into New York Comic Con to save the day! Amanda Leighton (Voice of Blossom), Kristen Li (Voice of Bubbles) and Natalie Palamides (Voice of Buttercup) and bring sugar, spice and everything nice, respectively, to their LIVE performance as The Powerpuff Girls in a special table read. Joining them will be Haley Mancini, series writer and the voice of Princess Morbucks. Get ready to power it up with sneak peeks of upcoming episodes, an inside look at the show and even a few surprises! Grab that Finn hat, polish your belly-button gem and wield your wildest Magisword at the Cartoon Network Costume Ball & Screening! We’ll showcase brand new episodes and special never-before-seen clips from TK! As always, you’re invited to come dressed as your favorite character and compete for fun prizes in our famous costume contest. Joining us as totally objective and impartial judges for the contest are Kyle A. Carrozza (Creator of Mighty Magiswords), Jeremy Shada (Voice of Finn, Adventure Time), Charlyne Yi (Voice of Ruby, Steven Universe and Voice of Chloe, We Bare Bears) and Rebecca Sugar (Creator of Steven Universe)!